Single File: a bunch of 45s in a row for no particular reason! good morning and so glad the goal was met..
Good morning, Joe and fellow McGaskonites. Glad you guys made your goal. Does this mean we will hear Surface Noise for another year? you were great last night, joe. but i bet you hear that all the time, don't ya? you smooth sonofabitch!! Good morning, everyone! It's an especially good morning here at FMU thanks to all of you. Yay Joe, yay FMU! So glad the goal was met! And before 10pm, amazing! "Boss! Boss! Da Goal! We Hit Da Goal!!!" "Yes Tattoo! Very Good We Hit The Goal"
Yo, sixteen grand over the top! Not half bad. NO one can hate the 16 grand buffer...!!! Congrats to all! Good Job Mr. Joe!! Good Job listeners everywhere!!! @foofs: Ha ha, I'll try to keep my language under control today. @Gord: Thanks for all your help this marathon! @jamesf: Can't hear it often enough! This is all really nice and almost seems a hangover mix. And all new music. Hey Joe. Congratulations to the whole team, that's EVERYONE. Managed to stay up for the first two sets and twenty minutes before the goal was reached. Terrific as someone once said. Hey Joe! Happy you were finally able to vent your frustrations with lawyers, guns and money! But did you suffer from the WFMU marathon cold that everyone was catching? I caught it! Woo! Such fun! @Karen: Thanks! @Jake: Yes, I'm sick. B23 here! Congratulations to WFMU for reaching your fund raising goal! I even got to talk to THE Joe McGasko on the phone! morning joe and everyone!!! we did it!!! @braveness23: Ha, I'm glad it wasn't A Joe McGasko! Is there a link yet so that we who live in other time zones can see the Sinfonia? I'm one hour ahead of Brian so I only got as far as Trouble and then conked out. Morning Joe + everyone! I thought your performance last night was up there with the best. And so many people said so. You looked so happy! Hello Andy. Real coming down Monday weather here. yeah, joe rocked it last night! joe should put on some twenty minute long prog cuts so he has less to back announce. What happened to those dulcet tones, Joe?! Have you been huffing ether? @estimo: Thanks! @SheilaB: You were amazing, my dear! I can't compare! Not sure whether it was because you played him last week but being sick and maybe talking slower your voice sounds surprisingly like Mister Rogers! Get well soon and put your cardigan on! Do you think the Sacred Paws own a Waitresses album? Sure, come around, @braveness23! Stop by Tartu as well! Dennis, you were great to hear last night! This M&Ms track is cute! FWIW, I worked the phones a few days an I think this marathon worked so well because a lot of people went the “Swag 4 Life” route. Great hyping of that. @Bronwyn: Yes, last night. Great work! someone used this CD as a Frisbee. sheilab - you sang in japanese AND with no lyrics sheet in front of you. YOU won the night. I had to miss the Sinfonia b/c I'm hosting my nieces this week. Is the video going to be archived by chance? I can't be the only WFMU person who feels hungover after last night — and I was sober! So I can't even imagine what Joe McG must feel like about now! He left nothing (including germs) on that stage! Those germs are dynamite, baby! They'll take ya' places! How you hanging in today Joe? You sounded great last night. That extra nasal drip sounds so manly! A band in Ireland in 1975 called themselves "Cromwell"? Bold boys. @PRB: Maybe that's why they didn't sell any records! :) @Kimzilla: You're so sweet! This is SUCH a perfect pop song. Endless payoffs in that set opener. Sooo satisfying. ...like this smooth groove. Oh, yeahhhhhh. Wow, Amanda's here, too! I'm surprised all you guys aren't still sleeping after that late night last night! another side-effect of the marathon is the emergence of new fmu friends on FB!! Joe, I slept well for the first time in a long time last night! I can't be alone. Are you kidding, Joe?! Today I begin doing the actual real-life work that the marathon prevented me from doing! No rest for the wicked, to coin a phrase. But I'm thrilled to be listening to your show AND I see I'm in good company! @Gaylord: The sleep of the just! You can't beat a day that starts with Pigbag! @Amanda: Aw, ain't you nice! i do indeed dig the name pigbag. but what is a pig bag?? best not to ask about the pigbag. these days, what ISN'T a pigbag? also: realizing now I've only heard the Leonard Nimoy version of Hammer..
oh man, flatt and scruggs! great cover! Good morning WFMU marathoners. Following Horace Greeley's heed. Great being part of such wonderful cause. This is what I call a cover! if so many folks hadn't covered dylan i never would have understood the lyrics to most of his music. Ah, this is great, Joe. Cheers to a successful marathon! I've always said that Dylan is only tolerable when someone else is performing his music. That F&S cover was excellent. congrats on the marathon, everyone! we did that! Congratulations on the making the goal! Thanks for all of your invaluable assistance this marathon, thedunkel! Soul covers of country songs -- gotta love 'em. Abrupt tonal shift of the morning achieved! Are you listening, John. Peel was the first freeform I heard without realising it. John Peel's all time favorite single! One of the great rock and roll voices. I forgotted to pledge? That's unpossible! Yaaaaaaaaayyyyyyy! Yep I am so excited for Irwin's show this week. Do the Regrets play opposite the Rugrats? your voice speaks for all the winnings of the marathon Joe! I would love to visit and volunteer at FMU during marathon someday, but I get the feeling I'd be wandering into a giant Petri dish. This really is like Stereolab. I love it! Hey Joe and all! Hope you're feeling a wee bit better! Thanks, Matt! Great job last night on "Preservation"! @Gaylord - good morning belatedly, hope you're feeling ok! hey all. the station making its goal may be the best news i've heard all year! yes! @ melinda. I did my first marathon this year. You gotta do it. it was fantastic wandering through the love and music. I was going to say Art Bears. Great set from this Estonian band! Your voice is pleasantly deep today, Joe. Hope you feel better soon! For historical reference, at what time Sunday night/Monday morning was the goal met?? Thanks to all volunteers and pledgers! You helped take it to the top! The time of day is needed for the Rebirth Certificate. Great set from Tartu Institut, Joe. Judging by the comments, I'd say 21:22, I could be wrong, I was multi-tasking during the marathon finale. Are all the songs in Estonian, do you know? damn, these guys are fantastic! @Brian: They sing almost always in Estonian, yes. The lyrics are apparently a bit surreal! I think one of their LPs has online translations. I don't miss Stereolab as much anymore. Thanks Joe. You bet, Zopa. Their new LP will be out here in April. The man delivering this morning after knocking Lawyers Guns and Money outta the park last night!!!! Raving fave, you brought down the house!! Aw, thanks, Cheryl, I had such an amazing time despite being sick! @fred: You said it! @bex: I feel as good as Joe McG feels (and as worn out as he sounds)! Thanks, Greg! I had such great fun. I'm glad that you got a salute from the stage for your incredible web banner! I made the mistake of working today...but seeing Ali at the top makes it all worth while! Once we saw Bowie next to Prince, we knew it had to be Ali! That would be nice, Gaylord. But this marathon neither lawyers, guns, or money could have kept me away. No better place to be when I got the news that Rock and Roll died, as Lennon would say. Ah, estimo, I was hoping you were still here! Thanks for the Tartu info. Do you live in Tartu or nearby? Yep, in Tartu. I know Kaspar from early ages, used to do snowboarding with him. Thought it was pretty cool, you working the phones for the Marathon, CJ. Greetings, ints! @estimo: Kaspar is a very nice guy! I liked Siim and Kristiina very much also. Well survived, Joe. Like the Estonian sounds. Good people. Me neither @Fred! What a relief! Great-sounding 'thon, too. Great job, all! 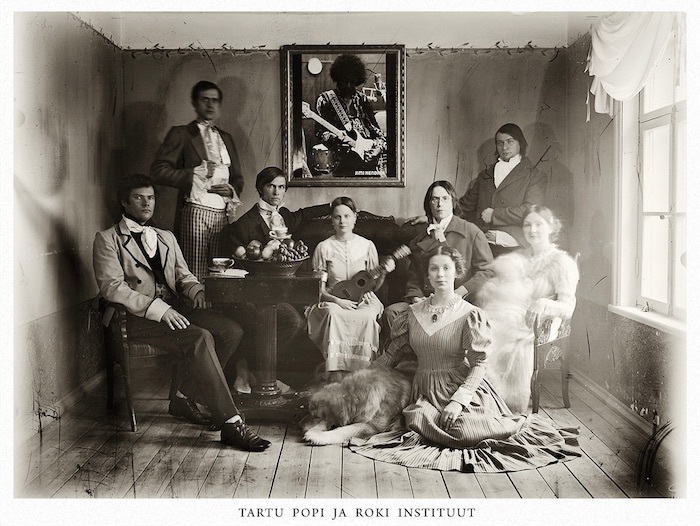 Really enjoying this Tartu Popi! There are other nice sound from Estonia as well, should send you some! Just loving everything by these guys. Thanks, Joe, Tartu Popi Ja Roki Instituut, and the audio team! Really excellent show, Joe, cold and all. Very proud of the JC crew. Thank you. That's a great photo, Estimo. It would have been great to see you there SC. I got to meet so many dj's, comment board friends, and other WFMUers. The love and music amidst the self-organizing chaos was other-worldly. Cool meeting you too Cooh John! JakeGould! Great to finally meet you.